Enrollment is underway for current students returning in the 2019-20 school year. Download an enrollment form here. Extracurricular activities: These vary from year to year, but have included Choir, Craft Club, Chess Club, and Outdoor Youth in the past. Carbondale New School is a progressive, independent, not-for-profit private school for students from PreK through eighth grade. We are not a new school; we have been here since 1974 when a small group of dedicated, determined, and visionary parents founded CNS. At the New School, we understand that students have a variety of learning styles and children's individual personalities are cultivated and respected. Children are allowed to develop at their own pace. Education is not a one-size-fits-all process. Studies have shown that empathy, self-discipline and persistence are better predictors of academic success than either IQ or socioeconomic background. CNS is unique in that its faculty and staff address these character issues daily using Love & Logic® classroom techniques. The Carbondale New School provides quality, student-centered education that inspires confidence and a lifelong love for learning. We respond to each student's unique abilities and learning style within an inclusive and supportive community that values the intelligence, worth and creativity of all children. We empower children with knowledge, skills, compassion and a sense of responsibility for self and others. As a parent-owned and operated not-for-profit corporation, we are committed to providing a diverse and dynamic learning environment as a leader in educational innovation. We will provide the autonomy and support to inspire excellence in the students, staff and parents of our school. CNS has small classes. Our commitment to small class size provides an intimate learning environment and promotes close bonds within the school family. CNS is a place where everybody knows your name. 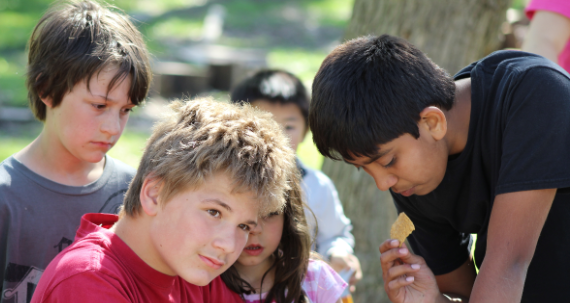 Learning comes to life through theme-based, hands-on experiences as well as many field trips. Our playground includes a small pine and hardwood forest and a big grassy area. Yes, CNS students get dirty! CNS students are passionate about fresh air and learning about nature, animal care, and becoming good stewards of the land. "We find that kids in K through eights on average do better in eighth grade than kids that go to a K through 5," said Schwartz, adding the research backs it up: The longer grade spans--the K through eight schools--provide a better learning environment and as a result students do better emotionally and academically. For over four decades, CNS has provided creative, quality education to students in a safe and nurturing environment. Working together, students, teachers and parents create a community that fosters and maximizes students' intellectual, social, and emotional growth. This sense of community has powerful and profound implications for its members. Students feel at home in their school. It is a place where they learn, grow, and feel respected and accepted. Parents know their opinions and input are not only welcome but also necessary to the school's success. Choosing to enroll your child at CNS means you are joining a family of people who will genuinely care about your child as a whole person. We help educate them into caring and loving citizens of the community and the world. CNS is not affiliated with any religion & happily includes families of many faiths & cultures.